The actor: Doug Jones has been nearly ubiquitous in Hollywood since the late ’80s, but few people would recognize him immediately. His talent for physical acting and his substantial screen presence (he’s more than 6 feet tall) make him a perfect fit for several menacing characters, often ones that are covered in prosthetic makeup. He’s been in numerous monster movies over the years, usually as the monster, and his regular work with Guillermo del Toro has earned him both cachet and substantial recognition. But he’s also played non-monstrous characters, often in TV guest spots or independent films. Most recently, he’s played an important recurring role in the latest season of the web series, The Guild. Jones talked with The A.V. Club about what he does while spending five hours getting into makeup, how he acted without dialogue in Buffy The Vampire Slayer’s famous episode “Hush,” and his growing body of roles that don’t require him to wear prosthetics. Doug Jones: That was a straight-to-VHS feature film that was made for about $1.75. It was a story of a newlywed honeymoon resort that was haunted by a transvestite zombie that was killing people. I was one of the first young husbands to bite the bullet. I got killed gruesomely with a curtain rod through the back of my head. Very proud of myself. My mom loves that movie—I’m kidding. The A.V. Club: Is it still available anywhere? DJ: I have it on VHS myself, so good luck on that. DJ: “Thin Clown,” yes. I was one of Danny DeVito’s sidekick gangs. He hung out with the Red Triangle Circus Gang. So I was one of his many circus act crazy sidekicks. AVC: Was that your first experience on a big budget Hollywood film? DJ: It was. That was like my first big studio film. I had done a couple of horror things before that, so I’d been on movie sets, but not like [Sings.] big studio Hollywood! That was the one. With Tim Burton as the director, and with huge stars like Michelle Pfeiffer and Michael Keaton as Batman, and Danny DeVito. Working with him everyday, it was dreamy. AVC: How did you end up on that one? DJ: Well, there you go. The story with that was I have a stuntman friend named Bob Yerkes. He’s a legend in the stunt world. He knows I can put my legs behind my head, and he comes from the circus world himself. So whenever a movie is going to use circus people or circus freaks or circus cats, they contact Bob Yerkes and say, “Who ya got?” So Bob saw that movie coming with the circus gang in it, and he thought of me immediately, and he referred me to the stunt coordinator for Batman Returns. He wanted me to come in and show him my contorting bits and see if there was anything he could do with me. Bob was just referring me as a sight gag on a day or two of filming, and then they should be done. So I go to the stunt office one day. They invite me to come in meet them, meet the stunt coordinator, and I bend up for him, put my legs behind the head, and do a little thing with my arms, and [Sings.] “wakka wakka yada, yada yada yada.” And he’s like, “Wow, that’s great, Doug, why don’t you stay right here, and I want you to meet somebody.” So he goes out of the room and comes in back with Tim Burton. And I’m like [Gasps.]. They come back in the room, and Tim says, “Great, you got the part then. So why don’t you go visit our casting office in the next building over?” I’m like, “Wh-wha-what part? I thought I was here for a sight gag.” Turns out there was a scripted part for a character named “Thin Clown,” who was partnered up with a “fat clown” in the Red Triangle Circus Gang as these sidekicks. I ended up being on the movie for over two months during the shoot, and had just a ball, and a big studio experience that got me on my way. AVC: How did you get into the circus contortionist stuff? DJ: Well, the contorting thing, I never got into it. Unfortunately, I was born with it in me. I am kind of a freak of nature who has loose joints, and I was able to put my legs behind my head, and it looked weird to people when I was a kid, so I kept doing it. It’s a great party gag. It became one of those things where my early agents knew that I had that ability, so I was sent out for a lot of auditions for commercials and TV shows that one might need a funny, “tah dah!” “Oh look, he can put his head… huh.” So that’s kind of how that happened. 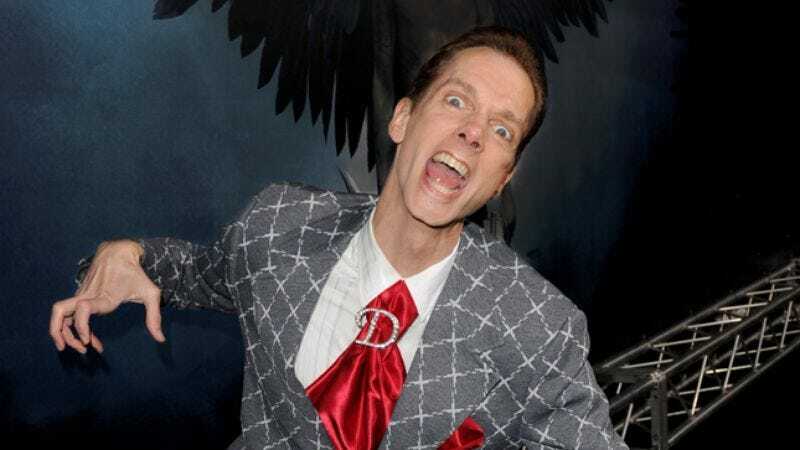 I’m surprised how many commercials and sitcoms and movies have a need for, “We just need something to come by the camera that’s really weird.” They call Doug Jones. DJ: I think it went straight to DVD with a healthy following so far. I didn’t know as much about the film as I should, because I was a cameo in the film. They shot me all in one day, and then used my bits sprinkled throughout. I’m one of two psychologists, or psychiatrists, that are interviewed. So here’s this gruesome story that’s going along about a guy who chops up people and then serves them in his diner to other people without them knowing about it. There’s a back-story to it: His wife did him wrong, so he’s gone nuts now, and there’s a girl who looks like his wife that he’s kidnapped. It’s a terrifying story, and every so often they go off to an interview clip with a psychiatrist talking about [Serious voice.] the mind of a serial killer, and what makes him do what he does. So I was one of those psychiatrists, which was kind of a fun cameo for me to do outside of rubber makeup that I’m known for, the prosthetic-makeup roles. So to do that with my own face and a jacket and acting like I was smart was great fun for me. AVC: Folks like Boris Karloff who got really associated with heavily made up roles were always concerned about people thinking of them as only being able to act through makeup. Do you ever worry about that? DJ: Yeah, I guess I did worry about that, but surprisingly, with the success with the more recent movies—I had quite a string there after the first Hellboy, with Pan’s Labyrinth, then The Silver Surfer, then Hellboy 2, and then I started doing cameos on other things like Quarantine, Legion. DJ: Legion is a great example. The director, Scott Stewart, came looking for me to do this cameo as “the ice cream man” in Legion. And even if you didn’t see the movie, you saw me all over the advertising for it, I stepped out of an ice cream truck and my jaw dropped down to my chin, and my arms grew, and legs grew. But the scene starts with me looking like Doug Jones. And Scott Stewart, the director, said he wanted to give my fan base a little treat of them seeing me in a big effects-driven movie without makeup on for my introduction. Directors like that have been doing it more and more over the last couple of years. DJ: And the indie film market is where I’ve been thriving with my own face. I have a release out now called My Name Is Jerry that’s my favorite human character I’ve ever played. It was written specifically for me, and it was filmed back in my home state of Indiana. I just love that story. I love my co-stars. It’s a charming story about coming of middle age, and what all that is. I’ve done that. I’ve had a mid-life crisis of my own, so getting to live through one again through the name of Jerry was depressing, but it had a happy ending. DJ: It is humbling, and my first thought is, “I am going to ruin this movie, and you should find someone who can do it better.” People who know your work and know your personality, they know your strengths and weaknesses. A director like Guillermo del Toro, he knows more about me than I do. I trust him when he tells me what part I’m going to be playing in something, because he’s envisioned that that can only be done by me. He knows it. My Name Is Jerry was much the same. Our director was a young filmmaker named Morgan Mead that I met when he was in film school. He came looking for me to be a cameo in his thesis project for film school—a little short film with a silly little character in it. That was me, so I did it. My process with independent film is: Read the script. Is it a story I would want to help tell? See what the character is. Is it a character that I would want to play, that challenges me, that motivates me, something? And the third step is, let’s have a coffee date with that director. Is it someone that I trust that I’ll be safe in his hands? Does he have a vision for filmmaking and storytelling? Meeting this young director when he was in film school, that coffee date turned into a three-hour laugh fest. We hit it off so, so well, storytelling back and forth. He’s remained a good friend until this day. Once he finished film school here in L.A., he went home to Indiana—we have that in common, we both come from Indiana—and he started writing My Name Is Jerry to make his first feature film. We’re now streaming on Netflix, and DVDs are out there and they’re selling well, and it did the festival circuit with tons of awards, including a Best Actor award for me at the Strasbourg Festival in France. So I’m tickled pink about that whole experience. And there have been many other films. I just finished a cop drama where I played a detective. It goes on. My face has been out there, just in smaller projects. DJ: That was my first experience with Guillermo del Toro. Because the specialty of wearing monster suits and creature makeups, the creature effects makeup designers, they’re the ones that design these looks and then say, “Oh you know who would be perfect to play that would be a guy named Doug Jones.” So that’s kind of how the referral process has made my career happen. That’s how I got into Mimic, then. I got a phone call one day from a guy who said, “We’re doing a night shoot tonight. Can you come down? We’re doing some re-shoots for this movie called Mimic.” Which at the time meant nothing to me, but sure, I needed the work. And that was being directed by Guillermo del Toro, his first American studio film. It turns out though that we hit it off because he loves monsters, and he is like an 8-year-old fanboy inside his own roly-poly jolly self. He’s this brilliant visionary storyteller genius, who really understands being a geek and a fan and loving gooey things. So he makes movies with his brilliance that will appeal to his 8-year-old boy that’s inside. That’s why he’s such a popular, beloved director. And we got all that in the discussion where he was asking me, [Imitates del Toro.] “What monsters have you played?” And I was telling him, “Oh, I’ve been this and that, in this movie and that movie.” “Oh really? Who did the makeup on that?” And he knows all the makeup artists and had followed their careers. He said, “I started up as a makeup artist in Mexico, and I’ve done my own films down there.” He’s selling himself to me. I’m like, “Gosh, this guy is so humble and real and genuine. I love him.” And then he asks for my card, and I gave him my card, and then five years later, this was ’97, five years later in 2002, I get a call about this little movie called Hellboy. They’ve just done a sculpture of Abe Sapien, and Guillermo del Toro had come in as the director, looked at the sculpture and was like, “Oh my gosh, that’s beautiful.” And the creature effects guys said, “You know, Doug Jones would be perfect to play this.” And he’s like, “Doug Jones! I know Doug Jones!” And he pulled out his card from his wallet that I had given to him five years prior, so that’s a good little reminder for all of us to carry cards with us, I guess. AVC: How did you get involved with makeup artists so that they would know? DJ: I starred in TV commercials, and one of my very first was the very popular McDonald’s campaign with a character called “Mac Tonight.” It was a crescent moon that had a face on it and sunglasses, and he sang at a piano like a nightclub singer. [Impersonates Mac Tonight.] “When the clock strikes, hey, half past six babe. Oh, ah!” That was me; I was the guy in the moon head. So because my commercial agent knew that I had a mime background—which is embarrassing, and that’s why I’m wearing myself as a mime on my shirt today—he submitted me for all these physical tomfoolery, costumed, pratfalls, whatever the commercial was asking for. He’s going to be wearing a mask and has to move like a nightclub singer and have a “love ya, babe” kind of presence. So the commercial agent submitted me for that, and the casting people loved me, and it worked out that I booked the spot. And that was the campaign, though, because the TV commercial turned into a 27-commercial campaign over the next three years. That gave me an awful lot of work and a lot of connections with creature-effects makeup people, because the guy who designed it and ran the shop would hire out for that commercial shoot that day, that week, that month, a whole new team of people that would puppeteer and sculpt and make repairs on this moon head. I met a lot of people who took my name and the memory of me back to the shop where they worked at. Maybe it was Stan Winston studios, or Rick Baker studios, or Greg Cannom. These are all Oscar-winning makeup artists. So my name would come up again when they would mention it, when they would see a design come through the shop, like, “We’re doing this zombie movie, this alien movie.” And they would see the design and say, “Oh, I just worked with a guy on that Mac Tonight thing. Tall, skinny Doug Jones.” So that’s how the waves started on the creature effects business, and keeps going to this day. I owe that branch of Hollywood my career. AVC: You do a lot of characters that don’t speak, and yet they’re very scary. How do you maintain that presence? DJ: It’s when you realize that dialogue is spoken verbally and non-verbally. When you believe that and know it, it makes characters that are written with no words more to do and more to be on film. And the Gentlemen from the “Hush” episode of Buffy were very much that. In fact, they couldn’t hear the human voice or their heads would explode [Goofy voice.] as you saw at the end of the episode. So I stole everyone’s voice in Sunnydale, and we went on our dastardly business of stealing hearts and putting them in jars. But we had a smile on our face, though. We were gentlemanly about it, very poised and graceful. But even between us, between the Gentlemen. My co-star was Camden Toy, another brilliant actor who wears lots of prosthetic makeups. That was our first time meeting each other, and we kind of developed this rapport on camera. There’s that one scene in the episode where we’re floating on a college campus, and we knock on a dorm door, and this kid answers the door in his pajamas, like, “Whaa?” We come barreling into the room and yank him onto the bed and start to do surgery, because we have a doctor bag with scalpels in it and stuff. So we start cutting him open to tear his heart out, but we’re doing it with these smiles on our face, and we’re nodding to each other, like, “Oh no, you go first.” “Oh no, this one’s yours.” So you can hear that dialogue watching us, not by hearing us, you know what I’m saying? That’s a whole art form unto itself. Any actor taking on a character should take him on head to toe, because there is a very physical presence in any character that you play. The words you speak are important, yes, but all of the non-verbal stuff going on—your facial expression, your posture, your gesturing, your body language. The same three words coming out of your mouth can be completely different with a different physical presence. When you say, “That wall sure is green,” you can say [Sarcastic voice. ], “That wall sure is green,” or you can say [Surprised voice. ], “Oh, that wall sure is green.” What comes with that is there is a different posture for each one, and different gesture for each one, and different face for each one. So you can say the same thing without using the green wall words. AVC: Looking at you résumé, you tend to alternate between monster movies, big special effects movies, and then you’re very fine, upstanding guys when you’re playing a regular person. Does that ever get a little schizophrenic? DJ: Ah, no. Well, I’m saying “no,” I should say absolutely “yes.” But any actor is a schizophrenic. We’re all nuts and out of our minds and assuming different personalities every other day. But when I’ve done a big movie job with lots of rubber makeup and glue on my face for months at a time, it’s nice to get a TV guest-starring gig that I can walk in. That episode of Party Of Five, I was a Vegas minister, so I was doing a quickie wedding, dressed in a toga with olive leaves in my hair, much like Caesar’s Palace or something. So that was beautiful fun for me. DJ: Augustus Margary was an orchid hunter from real life. He’s historically look up-able, and he is referred to in the book that the movie was being adapted from. That was a brilliant film by the way, one of the best pieces of writing I’ve ever seen. There’s a scene where some of the book is being read aloud by Meryl Steep’s voice while Nicolas Cage is reading it, thinking, “How am I going to make a movie out of this crap?” So she’s recounting all of the people who have died out there in the field on their orchid hunts. And they show a long clip of Augustus Margary, in the rainforest of somewhere, getting beaten to death by poachers who have stolen his orchids and now have run off leaving him for dead. So that was a one-day shoot for me that was all about me. Spike Jonze directed, and we had two stunt guys clubbing me to death over and over again with fake rain falling on me, which was colder than ice. I’m a skinny guy, so I started shivering. But it was good, because I was sick. All I had [in terms of makeup] was a wig and a beard that made me kind of like I had been out in the wild for a long time without a razor. AVC: Is that one where you read the whole script before auditioning and said, “I have to get in this in some way”? DJ: No. In fact, I got offered that weeks before it opened in theaters, just weeks, because that was re-shoots. That’s why I had Spike Jonze all to myself. Because they were already done with the shoot, and they just needed some visual bits to fill in that moment we were talking about where she’s recounting who was killed in the orchid hunts. That was one bit they hadn’t gotten yet, so they came back and made a day of it with a skeleton crew, just a few people, the cinematographer and a couple of grips, and that was it. AVC: What’s it like to be in a huge movie like that, to be one of the main characters though nobody ever sees you? DJ: That’s the fun part. In a del Toro film, he writes leading-man parts for monsters. It’s respectful and beautiful and a throwback to old-school Hollywood of Boris Karloff and Lon Chaney, like you were mentioning earlier. To be in a del Toro film as a monster is a plus, because he writes those characters with such humanity and such grace and such great relationships to work through on film, that explore the human condition but they look like a monster. So it really gives you a lot to play with, because we all feel like a monster of some sort every day anyway, like we don’t fit in really. And the Hellboy team is all about being misfits and celebrating being misfits. We’re saving the world, and they don’t even know about it because we’re a secret branch of the government who has to stay under wraps. We don’t have alter egos—that’s what makes that superhero movie a little bit different is that we’re not Clark Kent or Bruce Wayne by day. We’re monsters all the time, and that’s why we got to hide during the day. So that’s why I love it, and that’s what makes it different and yummy. But wearing the makeup for that, yes. Those two movies you mentioned, both Pan’s Labyrinth and Hellboy, one and two, the makeup jobs were five hours each for all the characters. Five hours to become Abe Sapien, and the Faun and the Pale Man in Pan’s Labyrinth, and also in Hellboy 2, the Angel Of Death was another lovely character I got to play. That’s the challenge when you’re putting on five hours of makeup before you start your workday. It makes it very long. And two hours of clean up at the end of the day makes for a 18 hour day, six days a week, and so that’s the only little drawback. They make it as comfortable as they can—the makeup artists are great. AVC: Do you just sit there and wait, or do you listen to music? DJ: Five hours is a long time, so of course there’s always a CD player going or an iPod deck that somebody’s got their collection going. And makeup artists are an eclectic, artistic bunch of people, because the music is always offbeat a little bit. And me, I’m a top 40 from the ’80s lover. I like me some Celine Dion, and they don’t want to hear that. So we argue over music, yes, and we joke around, tell stories from the last day. And thank goodness for laptops and the webernet, because we can look up YouTube and watch funny videos. AVC: You started doing the voice for the character in Hellboy II. How did that come about? What happened was that David was brought in and heard my performance on his earpiece that I had originally given, and stepped back and lowered the earpiece and said, “What am I doing here?” If I’d had a bad accent or a harelip or something, it would make sense, but he thought I sounded great, which is very kind of an actor to give another actor that due. So David declined taking credit in the film. He’s on IMDB, but as the credits roll in the film or in the opening credits, he’s not in it. And that was his doing. He didn’t do any press; he didn’t show up to the premiere, no red carpets, and when asked why, he said, “It’s out of respect to Doug Jones.” That’s unheard of among actors; we’re all very self-absorbed people. So after that, Hellboy: Sword Of Storms and Hellboy: Blood And Iron, the two animated features that I voiced Abe Sapien in, they were offered to David Hyde Pierce first, because those were just simply voice roles. Those were just voice with animation. David, bless his heart, declined, so they came after me, and just offered me that. And that was kind of a buffer zone between the two Hellboy movies to get the diehard fans, who would have followed those animation movies, to get them used to my sound, which was not that far off from David Hyde Pierce, really. We have the same kind of tonal quality. So it kind of worked okay. And Hellboy II was just kind of a shoo-in; I’ve already been doing it, so let’s keep doing it. DJ: Wow. When I read the script, I knew it was a piece of art that was gorgeous, and I wiped a tear away and said, “I have to be in this.” So when you know going in that you’re doing something really good, and I knew Guillermo by then, and knew that he was going to make a piece of art that, you know, whatever he touches turns to gold. But I had no idea a Spanish-language film with English language subtitles in America, will it take off or won’t it? I don’t know. When you’re at the Oscars a year later, as the only English-speaking actor in the film doing press all the way down this football field of cameras and interviewers and photographers, that’s when you realize, “I think we made something good here.” With six nominations that night and three wins, it was a dream come true, that movie was. AVC: And the Pale Man, especially, has become an icon. DJ: Isn’t that weird? I did not see that coming. My main focus in the film was the Faun character, and learning tons of Spanish dialogue, though I don’t speak. So I was terrified that I was going to ruin the movie. That was my main focus, “Can I live through this Faun character?” And oh, that’s right, we got this one week during the middle of the shoot where we’re doing this Pale Man scene. Okay, I guess I’ll do it. The makeup design was amazing. Eyes in the hands, none in the face, are you kidding me? That’s brilliant. Of course it was a bear to wear. Your senses are dulled. I couldn’t hear very well because I didn’t have any ears either, and no eyes, and I had to look through the nostrils of the thing. Ugh, it was awful. But when you see it, it’s like, whatever discomforts you might have suffered, it’s so worth it, because the after-effect is a scary monster that gave people nightmares but also played into the story so well as a representative, as a reflection of the stepfather in a way, this monster that wants to eat children. And I didn’t know going in that I would end up in not one, but three magazine covers that year. Because with that famous pose with the hands over the face, and there’s a parody YouTube videos of me with Pale Man kids running around with their eyes on their hands. Didn’t see that coming. And it’s such a great homage to a great artist see people on YouTube making fun of you. I love it, actually.